Lately, I exchanged some arguments with Derick Bailey about some details of the red-green-refactor cycle of the Test-driven development process. In short, the issue revolved around the fact that it’s not enough to have a test red or green, but it’s also important to have it red or green for the right reasons. While for me, it’s sufficient to initially have a NotImplementedException in place, Derick argues that this is not totally correct (see these two posts: Red/Green/Refactor, For The Right Reasons and Red For The Right Reason: Fail By Assertion, Not By Anything Else). And he’s right. But on the other hand, I had no idea how his insights could have any practical consequence for my own individual interpretation of the red-green-refactor cycle (which is not really red-green-refactor, at least not in its pure sense, see the rest of this article). This made me think deeply for some days now. In the end I found out that the ‘right reason’ changes in my understanding depending on what development phase I’m in. To make this clear (at least I hope it becomes clear…) I started to describe my way of working in some detail, and then something strange happened: The scope of the article slightly shifted from focusing ‘only’ on the ‘right reason’ issue to something more general, which you might describe as something like 'Doing real-world TDD in .NET , with massive use of third-party add-ins’. So, again, let’s say it clearly: TDD is programming, and programming is TDD. Other ways of programming (code-first, sometimes called cowboy-coding) are exceptional and need justification. – I know that there are many people out there who will disagree with this radical statement, and I also know that it’s not a description of the real world but more of a mission statement or something. But nevertheless I’m absolutely sure that in some years this statement will be nothing but a platitude. First, we need to have some initial sort of requirement. This can be a multi-page formal document, a vague idea in some programmer’s brain of what might be needed, or anything in between. In either way, there has to be some sort of requirement, be it explicit or not. – At the C# micro-level, the best way that I found to formulate that is to define interfaces for just about everything, even for internal classes, and to provide them with exhaustive xml comments. The next step then is to re-formulate these requirements in an executable form. This is specific to the respective programming language. - For C#/.NET, the Gallio framework (which includes MbUnit) in conjunction with the ReSharper add-in for Visual Studio is my toolset of choice. The third part then finally is the production code itself. 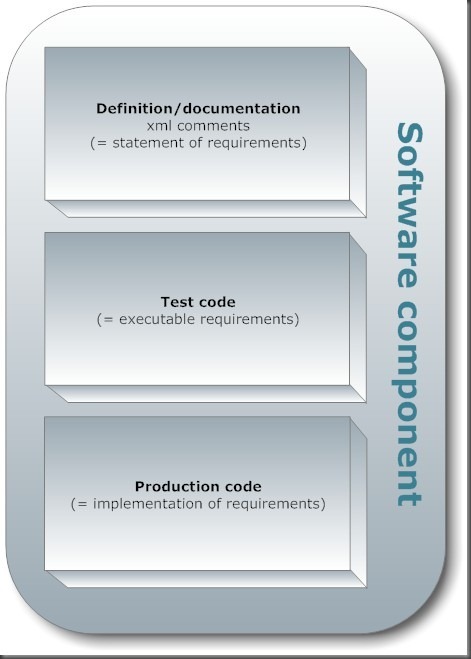 Its development is entirely driven by the requirements and their executable formulation. This is the delivery, the two other parts are ‘only’ there to make its production possible, to give it a decent quality and reliability, and to significantly reduce related costs down the maintenance timeline. As already said above, I start with writing down some words on the initial requirement, and I normally use interfaces for that, even for internal classes - the typical question “intf or not” doesn’t even come to mind. I need them for my usual workflow and using them automatically produces high componentized and testable code anyway. To think about their usage in every single situation would slow down the production process unnecessarily. /// Defines a very simple calculator component for demo purposes. /// Gets the result of the last successful operation. /// Will be <see langword="null" /> before the first successful operation. Starting this way gives me a method signature, which allows to use IntelliSense and AutoCompletion and thus eliminates the danger of typos - one of the most regular, annoying, time-consuming, and therefore expensive sources of error in the development process. In my understanding, the interface definition as a whole is more of a readable requirement document and technical documentation than anything else. So this is at least as much about documentation than about coding. The documentation must completely describe the behavior of the documented element. I normally use an IoC container or some sort of self-written provider-like model in my architecture. In either case, I need my components defined via service interfaces anyway. - I will use the LinFu IoC framework here, for no other reason as that is is very simple to use. This is basically the executable formulation of what the interface definition states (part of). There’s one principle of TDD that is just plain wrong in my eyes: I’m talking about the Red is 'does not compile' thing. How could a compiler error ever be interpreted as a valid test outcome? I never understood that, it just makes no sense to me. (Or, in Derick’s terms: this reason is as wrong as a reason ever could be…) A compiler error tells me: Your code is incorrect, but nothing more. Instead, the ‘Red’ part of the red-green-refactor cycle has a clearly defined meaning to me: It means that the test works as intended and fails only because its assumptions are not met for some reason. /// Adds the specified operands. /// Argument <paramref name="operand2"/> is &lt; 0. Apart from that, I’m heavily using xml code comments (see e.g. here for a detailed guide) because there is the possibility of automating help generation with nightly CI builds (using MS Sandcastle and the Sandcastle Help File Builder), and then publishing the results to some intranet location. This way, a team always has first class, up-to-date technical documentation at hand about the current codebase. (And, also very important for speeding up things and avoiding typos: You have IntelliSense/AutoCompletion and R# support, and the comments are subject to compiler checking…). Because I know that I will have to do the same test for the second operand in a few seconds, I save myself from implementing another test method for this purpose. Rather, I only will have to add another Row attribute to the existing one. From the test report below, you can see that the argument values are explicitly printed out. This can be a valuable documentation feature even when everything is green: One can quickly review what values were tested exactly - the complete Gallio HTML-report (as it will be produced by the Continuous Integration runs) shows these values in a quite clear format (see below for an example). So far, we have sheltered our method from unwanted input, and now we can safely operate on the parameters without further caring about their validity (this is my interpretation of the Fail Fast principle, which is regarded here in more detail). In the course of refining a method, it’s very likely to come up with additional test cases. In our case, we might add tests for some edge cases like ‘one of the operands is zero’ or ‘the sum of the two operands causes an overflow’, or maybe there’s an external test protocol that has to be fulfilled (e.g. an ISO norm for medical software), and this results in the need of testing against additional values. In all these scenarios we only have to add another Row attribute to the test. Remember that the argument values are written to the test report, so as a side-effect this produces valuable documentation. (This can become especially important if the fulfillment of some sort of external requirements has to be proven). /// Subtracts the specified operands. STOP! Hold on a second… before you go any further and before you even think about refactoring what you just wrote to make your test pass, you need to understand something: if your done with your requirements after making the test green, you are not required to refactor the code. I know… I’m speaking heresy, here. Toss me to the wolves, I’ve gone over to the dark side! Seriously, though… if your test is passing for the right reasons, and you do not need to write any test or any more code for you class at this point, what value does refactoring add? So why should you follow the refactor portion of red/green/refactor? When you have added code that makes the system less readable, less understandable, less expressive of the domain or concern’s intentions, less architecturally sound, less DRY, etc, then you should refactor it. You have to keep in mind that real-world software systems are usually quite large and there are dozens or even hundreds of occasions where micro-refactorings like the above can be applied. It’s the sum of them all that counts. And to have a good overall quality of the system (e.g. in terms of the Code Duplication Percentage metric) you have to be pedantic on the individual, seemingly trivial cases. Test-driven development is the normal, natural way of writing software, code-first is exceptional. So ‘doing TDD or not’ is not a question. And good, stable code can only reliably be produced by doing TDD (yes, I know: many will strongly disagree here again, but I’ve never seen high-quality code – and high-quality code is code that stood the test of time and causes low maintenance costs – that was produced code-first…). It’s the production code that pays our bills in the end. (Though I have seen customers these days who demand an acceptance test battery as part of the final delivery. Things seem to go into the right direction…). The test code serves ‘only’ to make the production code work. But it’s the number of delivered features which solely counts at the end of the day - no matter how much test code you wrote or how good it is. With these two things in mind, I tried to optimize my coding process for coding speed – or, in business terms: productivity - without sacrificing the principles of TDD (more than I’d do either way…). As a result, I consider a ratio of about 3-5/1 for test code vs. production code as normal and desirable. In other words: roughly 60-80% of my code is test code (This might sound heavy, but that is mainly due to the fact that software development standards only begin to evolve. The entire software development profession is very young, historically seen; only at the very beginning, and there are no viable standards yet. If you think about software development as a kind of casting process, where the test code is the mold and the resulting production code is the final product, then the above ratio sounds no longer extraordinary…). My rationale for now is: If the test is initially red during the red-green-refactor cycle, the ‘right reason’ is: it actually calls the right method, but this method is not yet operational. Later on, when the cycle is finished and the tests become part of the regular, automated Continuous Integration process, ‘red’ certainly must occur for the ‘right reason’: in this phase, ‘red’ MUST mean nothing but an unfulfilled assertion - Fail By Assertion, Not By Anything Else! When looking at open-source projects you will only see snapshots of the code that are taken when a developer commits. There should be no practical difference between the commits made by a developer that makes good design and implements lots of unit-tests and a good developer that practices TDD. The difference is that the TDD-process applies pressure on the developer to make a clean design and implement lots of unit-tests. Looking at a Test-Driven open-source project will only allow you to see the result of the TDD-process, not how to be Test-Driven yourself. To really learn it, you really need to watch someone do TDD. A book can help, but it is difficult to show the process in a book. Much better to see it done in real-time. The best way would be to pair-program with someone who is test-driven. The next best would be a live demonstration at a conference or gathering - perhaps you have a local user group? This is a great post; it was very informative. I look forward in reading more of your work. Also, I made sure to bookmark your website so I can come back later. Absolutely a brilliant article. TDD is widely used but not everyone practice it correctly. You have addressed very practical concerns and how to overcome those concerns effectively.